In the shadows of Brexit, the EU must do all it can to create a social union. We asked László Andor, former Commissioner for Employment, Social Affairs and Inclusion, about the prospects of the European Commission’s plans to set up a social pillar, the perceived neoliberal nature of EU institutions, and his idea of a European unemployment insurance scheme. The European Commission came out with a reflection paper on the social dimension of Europe. Its recommendations for the establishment of the so called Social Pillar (officially the European Pillar of social rights) aim at combatting social exclusion and discrimination, as well as providing rights and protections to the people of Europe (from the right to education, secure employment, childcare and minimum income to housing and assistance to the homeless) – the pillar is originally conceived as a set of guidelines for the euro area members, but any EU Member State can decide to apply them. What was your impression of the document? This paper is the product of a year-long consultation. And it is a very important document, as Jean-Claude Juncker, the president of the European Commission, said right at the beginning of his presidency that he was aiming at a “social triple A” rating for Europe. In the first year not much was done to get closer to this vision. With the help of Maria João Rodrigues, the vice-chair of the Progressive Alliance of Socialists and Democrats (S&D), the European Parliament has played a great role in giving concrete content to the Social Pillar. They connected the Social Pillar exercise with the technological changes and the increased flexibility of our labour markets (that were due to digitalisation and automation), and made it clear that the laws (the ‘social acquis’) of the EU have to be adjusted to them. This is important in the case of issues such as working time, where regulation still reflects a different reality. It is also important to mention that the Commission’s reflection paper presents a number of alternative visions, and based on that we have to make a decision between the following three options: Do we want the social dimension to only cover the free movement of workers? Are we planning to phrase it in relation to the Eurozone? Or do we want the EU as a whole to have a deeper cooperation on its social policies? Those who have at least some knowledge of the issue will see that the first two options won’t work, thus, the Commission – intentionally or unintentionally – tells us that we need to take significant steps in terms of the social dimension. There might be an intention behind it. We are acting in the shadows of Brexit, and the name of the game is to find out what Europe might look like after the UK leaves the Union. In previous years, the Brits have used every opportunity to block the creation of a social Europe. But once they are no longer part of the EU, other countries can move much more freely towards deeper integration. Is there a guarantee that the Member States will want to go in the same direction as the Commission wants them to? One of the most important issues for Member State governments is the situation of those of their citizens who work abroad, in other EU countries, because their companies sent them there. This issue cannot be reduced simply to questions of labour mobility, as these ‘posted’ workers are dealt with under the free movement of services, and neither to an issue related to the Eurozone, as Romania, Poland, or Sweden are not Eurozone-members. Thus, the third option will remain the only solution to regulate it. What would be the concrete achievements of the Social Pillar? At the moment, the communication on the Social Pillar only lists 20 items that it would see as important elements of a social model in Europe. These are questions where both the EU and the Member States might play a role, but the EU’s legal role differs from case to case. Point 19, for example, deals with the issue of homelessness: formally, the EU plays no role here at all. But the issue cannot be neglected when we define the European Social Pillar, for two reasons: first, the EU has to take into consideration the needs of the Member States, and second, EU assistance can be used to eliminate homelessness in the Member States. So, in this sense, the reflection paper and the Commission recommendations show us how the ideal EU should look like? In some sense it is about the ideal type, but it also signals to us what the EU is about. In a number of cases the EU is in an intermediary position, since it doesn’t have all the competencies, but it also cannot allow all Member States to just pursue their own self-interests. It has to foster cooperation – which often is about mutual learning, but in a crisis situation it might as well mean actual financial solidarity. In the last few years, you have often spoken about the importance of a European unemployment insurance scheme. Can you tell us more about it? 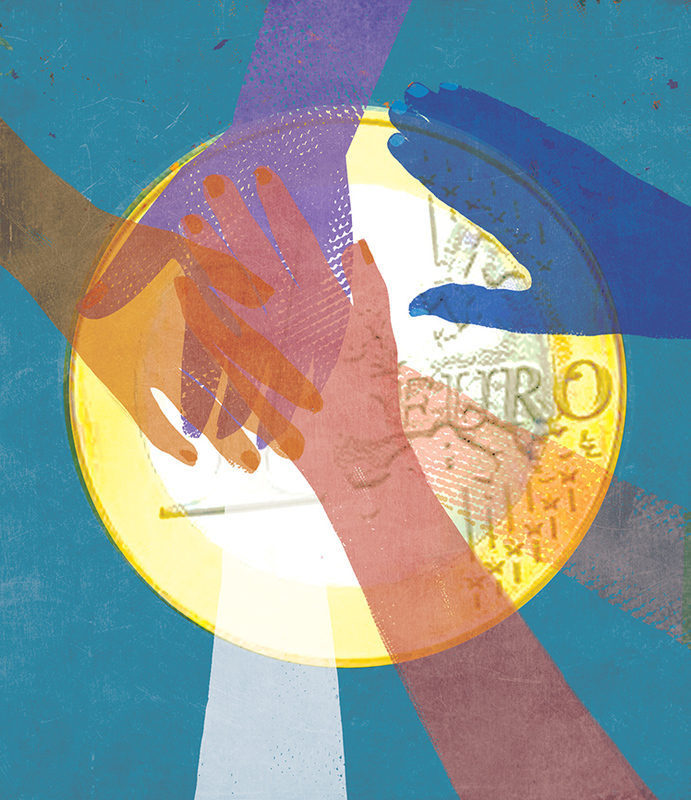 The monetary union was introduced with the Maastricht Treaty, which determined that the Eurozone countries would have a shared currency, but without a shared fiscal policy. This is problematic, because with the common currency the Member States have given up on their capacity to react to crises with the devaluation of their currency or to change their interest rates. In such a situation, the Eurozone would have had to react to shocks with a common fiscal policy, but at the moment we don’t have the appropriate instruments. If we don’t create such an option, the costs of economic crises will continue to be distributed unevenly among the Member States. This is exactly what we have seen in the last few years: when the crisis hit, countries in the centre, such as Germany or the Netherlands have almost not felt any of the social consequences, such as the growing unemployment and poverty. Those mainly affected the countries at the periphery. These countries must be compensated somehow, and the easiest, and most cost-effective way to do so is through the common financing of the excess unemployment. This is not a new idea. Already in the 1970s, when the plan of the monetary union was drawn up, there were suggestions to include a common response to unemployment (see the so-called Marjolin report). Similarly, in the 1990s there were numerous studies that explained why automatic stabilisers would be of great importance, but for political reasons they weren’t included in the monetary union. Finally, in 2010-2011, following the deepening of the Eurozone crisis, a number of calculations were made that prove that such a mechanism would have helped the Eurozone get out of the crisis much earlier, and the costs of the crisis would have been much smaller. Based on that, I would say, it is logical that the unemployment insurance is on the table, as one of the current proposals to overcome the Eurozone crisis and make the European Monetary Union (EMU) more resilient (see the Reflection Paper on the Deepening of the Economic and Monetary Union). Why did the idea fail in the 90s? Unemployment insurance, like any other insurance, is a kind of transfer. A rule-based and temporary transfer. However, the signing of the Maastricht Treaty happened during the time of German reunification – which in itself required Germany to transfer large amounts from West Germany to East Germany. Agreeing to take the risk of an additional transfer would not have been easy for the German leadership at the time. However, the concept of fiscal transfers continued to be seen as undesirable, and thus there has not been much debate about the fact that the Maastricht model would lead to a minimalist and vulnerable monetary union, and the missing elements would need to be added at some point. Only now, following the crisis, is there an awareness that this issue needs to be addressed. At least if we want to keep the common currency. What do you mean by “if we want to keep the common currency”? The EU managed to function before the common currency was introduced. We can return to that if there is no way to complete the EMU. But then we have to be frank about what we want, and say openly that preventing transfers is more important for us than having a common currency. If, however, the community wants to have a common currency, we need to invest in its resilience. The unemployment insurance would be one of the means of making us resilient to shocks. How much would an unemployment insurance cost? This would not be a large sum. The current EU budget (which mainly includes transfers) is 1 percent of the EU’s GDP. An additional 1 percent for a fiscal capacity would help us, most likely, to guarantee the stability of the Eurozone. However, there is no permanent need for that, as there are many periods when unemployment is decreasing – thus, in that period there is no need for payments towards most countries. This is, first and foremost, an economic question, and only secondly a social one. The reallocation of funds helps to uphold the purchasing power of those countries that are affected by growing unemployment. Thus, such a transfer would mean that the aggregate growth of Europe would be greater than without such a stabiliser. Meaning that the invested money, or at least a part of it, would return in the form of growing demand. How sustainable is such a growth and productivity-oriented system? Wouldn´t unconditional basic income (UBI) work better, in light of today’s changing reality of work relations? The world of work is indeed changing but not destroying jobs as fast as some sensationalist bestsellers would claim. In Europe, the highly digitalised and automated economies are also the high employment societies. Automation at some point may lead towards basic income but we are very far from this kicking in. I believe most people consider income security important, and many of us agree that having a minimum income scheme is necessary. However, the full employment goals and policies should not be given up. Governments, first of all, have to promote employment and only afterwards guarantee a minimum income to those who cannot be given jobs. In a European context, the idea of the unconditional basic income also shares the weaknesses of the orthodox fiscal framework, i.e. it is not connected to business cycles and asymmetric shocks, while unemployment insurance is. Most people agree that transfers are justified where there is a real need, but I still fail to understand why we would need to provide basic income to rich people at all times. On top of that: quantifying an UBI is very hard. If it is too low, it does not guarantee decent living. If it is too high, it is impossible to fund it. In your model, are Member States expected to collect money during the years of economic growth, so that they can later spend it in the crisis years? There are many different models. The most important question that needs to be clarified is whether the reallocation of money is only interregional or also intertemporal. If it is only interregional, that would mean that the unemployment insurance only allows us to reallocate money from the surplus countries to the deficit countries. However, if we talk about an intertemporal model – and that is what I would support – that would also allow us to collect a surplus in the good years that we can use in the bad years. The economic stabilisation effect would become much greater and benefit all. How would this unemployment insurance look in practice? The simplest thing would be to build a re-insurance system for national unemployment benefit schemes. Individual workers would need to do nothing but Member States would enter a risk community. A certain amount of harmonisation would be needed in order to ensure that the transfer does not simply function as a budget support but actually protects the innocent. A more complex idea, and such has been designed by the German economics professor Sebastian Dullien, would be to create a basic European unemployment scheme. All EU workers in all EU countries that join the scheme would be members. However, this would only provide the basic benefit, i.e. 50 percent of the lost income for 6 months, and the Member States would need to top up and lengthen the eligibility period according to their needs and priorities. Eventually, national models would continue to be diverse, but the common core would provide basic protection and function as an economic and social stabiliser. At a time when many Europeans only see the EU as a set of constraints and sometimes as a fiscal policy, this would represent tangible solidarity in hard times for the most vulnerable groups. In order to avoid a moral hazard, we also need to create a regulatory body, and this body needs to have authority to limit the payments, in case it sees any irregularities or abuse. Such a body – in which both employers and employees would be present – could also make suggestions to adjust the rules, if necessary. Besides that, joining the system needs to have conditions as well. We need to harmonise labour statistics, the functioning of employment services, and so on, so that we can compare the performances of different countries. This harmonisation would be a great step forward for the EU. Today, EU citizens have a right to work in any Member State. Does labour mobility pose a challenge to the Social Pillar? This is an important issue, but a different dimension. The Social Pillar deals with the particular rights a person needs to have in a Member State. And rights are realised in the relationship between the state and the individual. Mobility is a different category: in this case, we want to regulate a situation in which the workers are employed in a country where they are not citizens. The free movement of labour is one of the important principles of the EU, thus it doesn’t matter what citizenship one holds when he or she seeks to find a job in the EU (although in the case of new members there might be a transitional period for a maximum of seven years). However, there might be huge differences between the social rights in each country. Thus, there needs to be some coordination, but the Social Pillar itself cannot deal with that. This topic forms part of the labour mobility package that was put forward by Marianne Thyssen, Commissioner for Employment and Social Affairs. These are two separate stories and they have been launched on different tracks at different times. One looks at the range of social policies that need to be seen as norms in Europe, and the other one looks at how the social rights can be coordinated when workers move from one country to another. You have published an article with economist Andrew Watt in which you argue that the structure of the EU is not fundamentally neoliberal, it is the politics that shape it – why have the ideas of the Left and the progressives become so marginalised in the EU institutions? In our article, we have argued that the technocrats in Brussels do function under political control, and those who would like to see a change have to start a proper political debate to challenge the most influential trends. This means mainly confronting the European People’s Party (EPP) and their policies. EPP members often point their fingers towards European bureaucracy, in order to hide the political nature of their decisions. The socialists have won far fewer elections in the last few years than the Centre-Right, thus they have had fewer opportunities to influence European trends. It is, however, important to note that in some major topics, such as the rule of law, or the main elements of the European social model they have managed to work together with the social wing of the EPP. But whenever they became stronger, such as in the late 1990s or in 2012-2013, they weren’t able to put enough effort into correcting the faulty practices and policies. To make a change, better coordinated analytical and political work is needed. We also have to do more in order to reach those marginalised groups who have stayed away from elections.